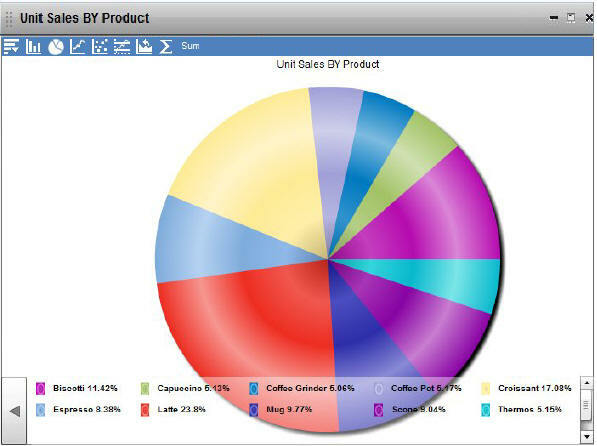 When displaying an active report for Adobe Flash Player as a chart in Report Painter, you can modify the legend options by using the Format tab of the Report Options dialog box. When the chart is run, you can click a Legend icon to show or hide the chart legend. 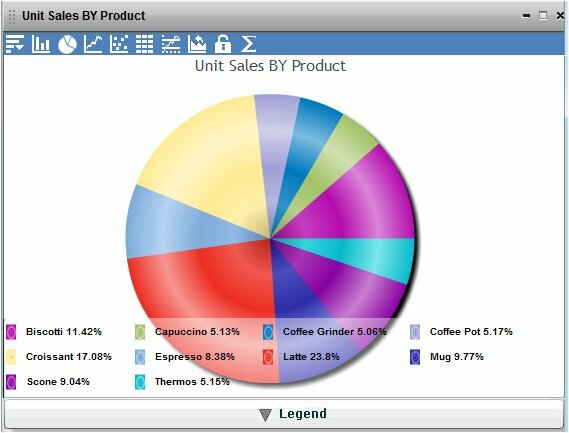 Legend options are available only when the initial presentation of the active report is set to Bar Chart, Line Chart, Pie Chart, or Scatter Chart. The legend options are available in active reports for Adobe Flash Player and for PDF. 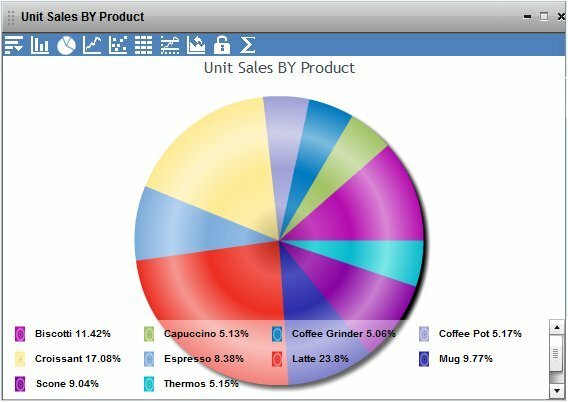 Create a report in Report Painter. From the Report menu, click Output. The Report Options dialog box opens. From the Output Format drop-down list, click active report for Adobe Flash Player (FLEX) or active report for PDF (APDF). Tip: You can also select these output formats from the output format drop-down list on the Report Painter toolbar. On the Report Options dialog box, click the Format tab. The Format tab provides options for formatting an active report. To enable the Legend Options on the Format tab, use the Initial Presentation drop-down list to select Bar Chart, Line Chart, Pie Chart, or Scatter Chart. The Legend Options are enabled. The Legend Options are not available for the Default, Grid, Pivot, or Other Chart initial presentations. The chart legend can be fixed or collapsible in the output. Fixed. When the chart legend is fixed, the legend appears underneath the chart, and you cannot hide the legend or position a Legend icon. This is the default selection when the legend options are enabled. Collapsible. When the chart legend is collapsible, you can show or hide the chart legend in the output. You can also choose where the Legend icon appears on the chart. From the Minimized Position drop-down list, click Bottom Left, Bottom Center, or Bottom Right. Bottom Left is the default minimized position when you select Collapsible as the legend option. Click Run to view the output. The following image shows a pie chart with a fixed legend. The format of the chart is FLEX. The following image shows a pie chart with a collapsible legend. The format of the chart is FLEX. The Legend icon is positioned at the lower-left by default. Click the arrow to show or hide the chart legend. The following image shows a pie chart with a collapsible legend. The format of the chart is FLEX. The Legend icon is positioned at the bottom center. Click the arrow to show or hide the chart legend. The following image shows a pie chart with a collapsible legend. The format of the chart is FLEX. The Legend icon is positioned at the lower-right. Click the arrow to show or hide the chart legend.